Background: Charcot neuroarthropathy (CN) is a progressive, destructive disease of the bones and joints. Charcot ankle and hind foot deformities are challenging to treat, and arthrodesis is the method of choice in correcting these deformities. The aim of this study is to evaluate the results of ankle fusion by narrow DCP through anterior approach in cases with Charcot neuroarthropathy of the ankle. Methods: A prospective study of 17 patients (12 men) at an average follow-up time of 41.18 (25-60) months. The indications for surgery were Charcot neuroarthropathy of the ankle with non-braceable deformity and instability with impending ulceration and/or arthritis. The mean age was 57.06 (46 years to 70 years) years, mean body mass index was 36.59 (range 26-47) and mean duration of diabetes mellitus was 20.12 (6 years to 46 years) years. Results: The mean operative time was 56.18 (40 to 70) minutes. Bony fusion achieved radiologically in 10 feet (58.8%); with a mean time to union of 6.65 (4 to 10) months; the remaining patients had a stable painless fibrous union. The AOFAS- hind foot scale improved from average preoperative score of 53.3 ± 5.2 to average postoperative score of 77.5 ± 9.2. Complications include two minor infection, two deep infection and two proud screws. Conclusions: Fusion of Charcot ankle with narrow DCP using a single anterior incision is a simple economic method, with less soft tissue disruption, ease of deformity correction, and high rate of patient satisfaction. Charcot neuroarthropathy (CN) is a progressive, noninfectious, destructive disease of the bones and joints in persons with sensory neuropathy. Diabetic neuropathy is the most frequent cause of CN in the foot and ankle; other causes include alcoholism, myelomeningocele, and congenital insensitivity to pain [1,2]. Jean- Martin Charcot  in 1868 is the first to describe the neuropathic arthropathy that now bears his name and in 1936, Jordan  described its occurrence in patients with diabetes mellitus (DM). The incidence of CN in diabetic patients is about 0.12% and Charcot foot changes were noted radiographically in 1.4%. Simultaneous bilateral involvement was rare; occurring in only 1 of 115 patients, the median time of onset in the second foot was reported to be 2 years [1-6]. Many theories were postulated to explain the development of CN. In the neurotraumatic theory, CN occurs when insensate joints are subjected to repetitive microtrauma that resulted in typical Charcot changes. In the neurovascular theory, CN occurs when autonomic dysfunction leads to increased blood flow resulting in bone resorption and weakening. In the inflammatory theory, the inflammatory cytokines such as tumor necrosis factor-α and interleukin-1 are implicated in the pathogenesis of CN [1,7]. Eichenholtz classification of CN is a widely accepted classification for the progression of CN and includes 3 stages: Stage I, the fragmentation or dissolution phase, Stage II, the coalescence period and Stage III, the reconstruction phase. Based on anatomic location Brodsky classified CN into 3 Types: Type 1 collapse (60%) affects the tarsometatarsal joints, Type 2 collapse (10%) affects the subtalar and Chopart joints, Type 3A collapse (20%) affects the ankle joint and Type 3B affects calcaneal tuberosity (10%). He also pointed that midfoot joints usually need a short period of immobilization, whereas affection of joints of the hindfoot and ankle require longer immobilization up to 1 year [1,8,9]. Management of CN is based on many factors and includes nonsurgical, pharmacologic or surgical treatment. Immobilization is the cornerstone of nonsurgical treatment and includes totalcontact cast and Charcot restraint orthotic walker. Pharmacologic treatment includes the use of bisphosphonates and Vitamin D. Bisphosphonates are used for the treatment of associated osteopenia. Vitamin D supplementation is prescribed to treat vitamin D deficiency usually present in diabetic patients. Surgical treatment is offered to patients with unstable deformity of the foot and ankle and includes exostectomy, arthrodesis and amputation [10-12]. Arthrodesis is usually reserved for Eichenholtz coalescence or reconstruction phases either by internal or external fixation. Internal fixation methods include screws, plates or tibiotalocalcaneal nail with an average time to fusion of 11 to 22 weeks and usually requires a prolonged period of rigid immobilization with no or minimal weight bearing followed by permanent protective bracing. External fixation may be done as a single or multiple stage treatment and is reserved for cases where there are ulcers with underlying osteomyelitis, poor soft-tissue envelope, poor bone quality, and morbid obesity. External fixation in diabetic patients is associated with a high complication rate including pin tract infection, pin breakage and risk of tibial shaft fracture after its removal [1,13-16]. The purpose of this prospective study was to review our preliminary clinical and radiographic results of ankle arthrodesis with use of stainless steel narrow dynamic compression plate (DCP), through an anterior approach in cases of CN of the ankle and to compare our results with those of other workers. This study was approved by the institutional review board (ethical committee) of our institution. Informed consent was obtained from the patients following the guidelines set forth by our institution and by the Declaration of Helsinki and Good Clinical Practice. This prospective study followed a consecutive series of 17 patients affected by CN of the ankle joint, who were treated with ankle fusion fixed by regular dynamic compression plate (DCP), through the anterior approach, in the period from January 2010 to January 2015. There were 12 men (70.6%), and 5 women (29.4%) with a mean age of 57.06 years ± 7.31 years (ranged from 46 years to 70 years). The mean body mass index (BMI) was 36.59 ± 5.97 kg/m2 (range 26–47 kg/m2); five patients were morbidly obese with a BMI >40 kg/m2. All patients were diabetic; 13 had Type-2 and 4 had Type-1 DM, and the mean duration of DM at the time of surgery was 20.12 years ± 13.84 years (ranged from 6 years to 46 years). All patients had evidence of peripheral neuropathy and four had a diabetic retinopathy. The indications for surgery were non-braceable ankle deformity and instability with impending ulceration and/or arthritis of the ankle joint. The contraindications included active infection, ulceration, and critical peripheral vascular disease. The surgical technique described and analyzed in this study was performed by a single author (E.K.). The procedure was performed under general or spinal anaesthesia. Prophylactic antibiotics were given at anesthesia induction. The patient was placed supine with a pump under the ipsilateral hip and pneumatic thigh tourniquet was routinely used (Fig. 1A-1C). 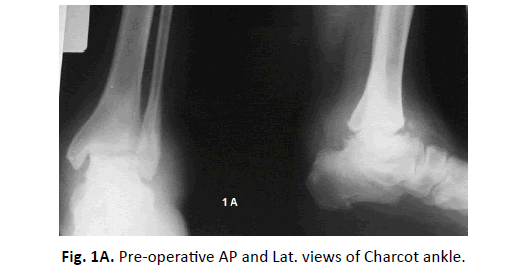 Fig 1A: Pre-operative AP and Lat. views of Charcot ankle. Fig 1B: Pre-operative CT sagittal view of the ankle. An anterior approach to the ankle is used with a longitudinal incision carried down the lateral border of the tibialis anterior tendon. The latter is retracted medially in the distal part of the wound and retracted laterally in the proximal part, crossing the plate. A combination of osteotomes, curettes, and rongeurs were used to remove the articular cartilage from the distal end of the tibia, the superior surface of the body of the talus, the medial and lateral sides of the talus, as well as the articular surfaces of the medial malleolus and the distal fibula. Joint surfaces were prepared down to bleeding subchondral bone. Angular and rotational deformities were corrected to achieve a plantigrade foot. The position of ankle fusion was neutral flexion, 0° to 5° of valgus hind foot angulation, and 5° to 10° of external rotation of the foot, as described by Scranton . A standard AO narrow DCP was appropriately contoured to adapt the lower tibia, the talus, and navicular bone if needed. First, an eccentrically placed screw was inserted into the distal tibia but not fully tightened. Then a second screw was inserted in the talus through the over the contoured plate and fully tightened to pull the talus and position it under the tibia. Then the first screw was fully tightened to add further compression of the fusion surfaces. The third screw was inserted through the angle of the plate into the talus. The fixation was then completed. Due to associated peripheral neuropathy and osteoporosis, the concept of a ‘super construct’ was used in most cases for stabilization of the deformity which entailed an extension of fixation beyond the zone of Charcot involvement to provide a long segment of fixation. 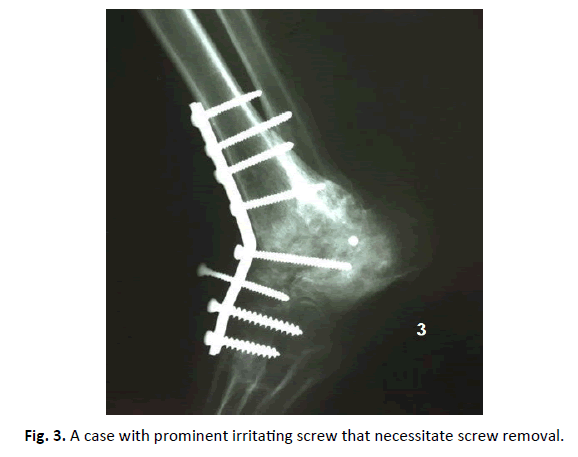 This was achieved by inserting an additional screw in the navicular bone and or through the subtalar joint . The alignment and hardware position were checked with fluoroscopy. The tightness of the tendo-Achillis often was improved following wedge resection. Neither lengthening of the tendo-Achillis nor bone grafting was needed in this series. The tourniquet was deflated to identify and control any active bleeding, and then the wound was irrigated thoroughly and closed with delicate skin and soft-tissue handling. Postoperatively a well-padded below knee plaster back slab was applied. At first visit 2-3 weeks postoperatively, the wound was checked, the sutures were removed, and a non-weight bearing wellpadded fiberglass short leg below knee cast was applied. Serial radiographs were done at 12, 16 and 20 weeks to assess fixation stability and status of fusion. The radiograms were analyzed by an independent radiologist, and two separate reviewers who were not involved in the initial surgery. Non-weightbearing was continued for at least three months followed by partial weight-bearing for three more months, guided by the clinical and radiological progression of healing. Full weight-bearing in a removable protective Charcot Restraint Orthotic Walker (CROW) was prescribed when there was evidence of radiological bony union or clinical stable fibrous union. The average follow-up time was 41.18 ± 11.31 months (ranged from 25 months to 60 months) after the index surgery. The final results were assessed comparing the preoperative and postoperative American Orthopedic Foot & Ankle Society (AOFAS) hind foot scale. We also recorded achievement of full weight-bearing, bony fusion, and any secondary surgery. The statistical analysis was descriptive and analytical. The database is stored in the Microsoft Excel program and analyzed using Microsoft Excel version 2013. The mean operative time was 56.18 ± 8.39 (range 40 to 70) minutes. Fusion was confirmed radiologically in 10 of 17 feet (58.8%); with a mean time to union of 6.65 ± 1.73 (range 4 to 10) months. The remaining 7 patients (41. 2%) had a stable painless fibrous union; patients with fibrous unions were asymptomatic and had a stable foot (Fig. 2A and 2B). Limb salvage was achieved in all patients. All patients were provided with a permanent protective Charcot Restraint Orthotic Walker (CROW). Fig 2A: Pre-operative clinical photo showing ankle deformity. 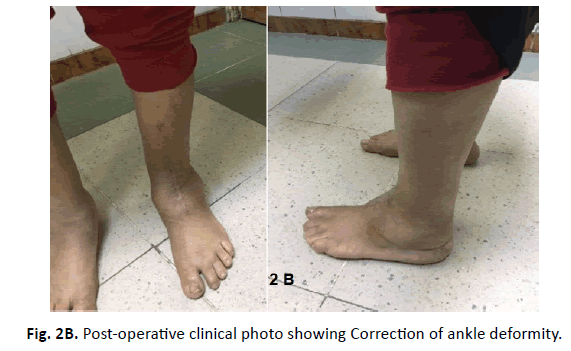 Fig 2B: Post-operative clinical photo showing Correction of ankle deformity. At the last follow-up, the AOFAS- hind foot scale changed from an average preoperative score of 53.3 ± 5.2 (range 40 to 58) to an average postoperative score of 77.5 ± 9.2 (range 54 to 88). Complications were recorded in 6 patients (35.3%). Two patients had minor wound infection that was treated with oral antibiotics. Two patients developed a deep infection that underwent debridement and lavage. Removal of all hardware after clinical and radiological union resulted in healing of the infection. Proud screw removal was required in two patients (Fig. 3). Fig 3: A case with prominent irritating screw that necessitate screw removal. Patients with CN often present with a massive bone loss, major angular deformity, joint destruction, subluxation or dislocation, combined with soft tissue contractures. The surrounding soft tissues of the joint are usually poorly nourished, with reduced arterial perfusion and venous drainage. Complications of failed surgery can be devastating, leading to sepsis or even amputation. Deformities resulting from CN of the ankle and hind foot are often multiplanar and are challenging to treat, and arthrodesis is the method of choice in correcting these deformities. The goal of surgery is to establish a plantigrade foot, a well aligned, stable ankle with a minimal risk of ulceration, and improvement of the quality of life [12,19]. The choice of fixation, whether internal or external, depends largely on the presence or absence of active infection and bone quality. Rigid internal fixation is associated with a decreased time of union, increased rate of union, reduced infection rate, less discomfort, and earlier mobilisation. Reconstructive surgery of CN of ankle and hindfoot resulted in high patient satisfaction (80%), and excellent limb salvage rate (97%), but is attended with high complications rate (43%) as infection (30%), malunion or nonunion (25%) and secondary surgery (34%) [12,20]. In this study of difficult multiplanar Charcot ankle deformity, it was possible to achieve stable plantigrade foot in all patients either by bony or stable fibrous union with the use of simple economic narrow DCP, done through a familiar anterior ankle approach. The use of a narrow DCP through anterior midline incision was used for arthrodesis of the ankle joint by other workers for other indications. Locked anterior plates were also used to achieve ankle fusion for other indications [21-23] (Table 1). Key: Pts: patients, M: Male, F: Female, CN: Charcot Neuropathy, OA: Osteoarthritis, PT: Post-traumatic, AVN: Avascular Necrosis, TTC: Tibiotalocalcaneal, TAR: Total ankle replacement, TT: Tibiotalar, DCP: Dynamic compression plate, AOFAS: American Orthopedic Foot & Ankle Society, VAS: Visual Analog Scale. Table 1. Results of ankle fusion for different causes including Charcot neuropathy by some authors. All other studies were retrospective. 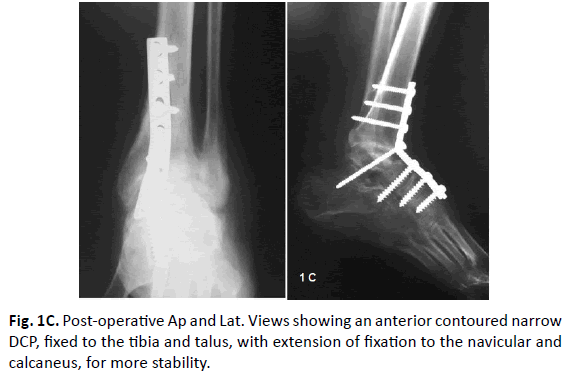 Some authors reported tibio-talar and tibio-talar-calcaneal fusion through a lateral trans-fibular approach using locked 90° titanium cannulated LC-angled blade plate,  locked humeral plate,  and locked PHILOS plate  (Table 1). Average time to achieve a stable union of the ankle joint in this study was 6.65 ± 1.73 months. It was longer than other reported series, probably because the etiological background was Charcot arthropathy in all our patients, which is known for its difficult and delayed union time. In most of the reported articles on ankle fusion, the etiological background was other indications, and in a few of them, some cases of CN were included. (Table 1) We had 88.24% satisfactory result and 11.76% unsatisfactory result. In this study, we had high patient satisfaction rate with improved quality of life in 88.24% of them, and 11.76% had an unsatisfactory result. This is comparable or even better than other reported series, considering that all our patient were CN while other studies reported results mostly on post-traumatic osteoarthritis (Table 1). In this study, we had few complications and few secondary surgical procedures. Two patients had minor wound infection, two patients developed a deep infection that ended with metal removal and two patients had one proud screw that required removal. This is a favorable result if compared with other reports (Table 1) [19,21-25]. The major limitation of our study was the small number of patients. A larger number of patients is required to give solid conclusions and recommendations, however, this sample resulted in encouraging satisfactory preliminary clinical and radiological outcome that helps as a basis for future studies. It might be better to accurately assess the post-operative bone fusion with CT imaging of the ankle at the final visit. Ankle fusion in selected patients with CN of the ankle using stainless steel narrow DCP through a single anterior incision is a simple, economical method with less soft tissue disruption, early rehabilitation, less complication rate, high rate of union, and high rate of patients’ satisfaction. The anterior approach is familiar to most surgeons and allows good visualization, easier correction of the deformity, and proper hardware positioning. Ven A., Chapman C.B., Bowker J.H. : Charcot Neuroarthropathy of the Foot and Ankle. J Am Acad Orthop Surg. 2009;17:562-571. Schon L.C., Easley M.E., Weinfeld SB. : Charcot neuroarthropathy of the foot and ankle. Clin Orthop Relat Res. 1998;349:116-131. Charcot JM. : Leçons sur les maladies du système nerveux, in Archives de Physiologie, 1868. Jordan WR: Neuritic manifestations in diabetes mellitus. Arch Intern Med. 1936;57:307-366. Stuck R.M., Soh M.W., Budiman-Mak E., et al. : Charcot arthropathy risk elevation in the obese diabetic population. Am J Med. 2008;121:1008-1014. Smith D.G., Barnes B.C.., Sands AK., et al. : Prevalence of radiographic foot abnormalities in patients with diabetes. Foot Ankle Int. 1997;18:342-346. Baumhauer J.F., O’Keefe R.J., Schon L.C., et al. : Cytokine-induced osteoclastic bone resorption in Charcot arthropathy: An immunohistochemical study. Foot Ankle Int. 2006;27:797-800. Brodsky J.W. : The diabetic foot, in Coughlin MJ, Mann RA, Saltzman CL, eds: Surgery of the Foot and Ankle. ed 8. St. Louis, MO, Mosby, 2006, pp 1281-1368. Pinzur M.S., Lio T., Posner M.: Treatment of Eichenholtz stage I Charcot foot arthropathy with a weightbearing total contact cast. Foot Ankle Int. 2006;27:324-329. Jude E.B., Selby P.L., Burgess J., et al. : Bisphosphonates in the treatment of Charcot neuroarthropathy: A doubleblind randomised controlled trial. Diabetologia. 2001;44:2032-2037. Siebachmeyer M., Boddu K., Bilal A., et al. 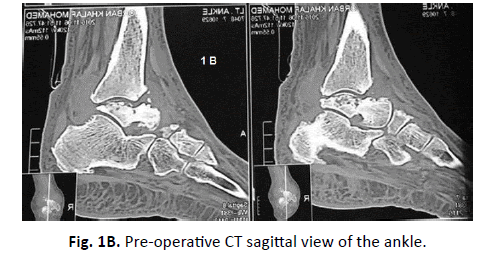 : Outcome of one-stage correction of deformities of the ankle and hindfoot and fusion in Charcot neuroarthropathy using a retrograde intramedullary hindfoot arthrodesis nail. J Bone Joint J. 2015;97-B:76-82. Wukich D.K., Raspovic K.M., Hobizal K.B., et al. : Surgical management of Charcot neuroarthropathy of the ankle and hindfoot in patients with diabetes. Diabetes Metab Res Rev. 2016;32:292-296. Simon S.R., Tejwani S.G., Wilson D.L., et al. : Arthrodesis as an early alternative to nonoperative management of Charcot arthropathy of the diabetic foot. J Bone Joint Surg Am. 2000;82:939-950. Caravaggi C., Cimmino M., Caruso S., et al. : Intramedullary compression nail fixation for the treatment of severe Charcot deformity of the ankle and rear foot. J Foot Ankle Surg. 2006;45:20-24. Dalla Paola L., Volpe A., Varotto D., et al. : Use of a retrograde nail for ankle arthrodesis in Charcot neuroarthropathy: A limb salvage procedure. Foot Ankle Int. 2007;28:967-970. Conway JD. : Charcot salvage of the foot and ankle using external fixation. Foot Ankle Clin 2008;13:157-173. Scranton PE. : An overview of ankle arthrodesis. Clin Orthop. 1991;268:96-101. Sammarco V.J., Chevillet J.: The role of internal fixation in surgery of the charcot foot and the evolution of ‘super-construct’ techniques. Current orthopaedic practice. 2010;21:233-239. Shearman A.D., Eleftheriou K.I., Patel A., et al. : Use of a proximal humeral locking plate for complex ankle and hindfoot fusion. The Journal of Foot & Ankle Surgery. 2016;55:612-618. Dohm M.P., Benjamin J.B., Harrison J., et al. : A biomechanical evaluation of three forms of internal fixation used in ankle arthrodesis. Foot Ankle Int. 1994;15:297-300. Mohamedean A., Said H.G., El-Sharkawi M., et al. : Technique and short-term results of ankle arthrodesis using anterior plating. International Orthopaedics. 2010;34:833-837. Guo C, Yan Z, Barfield WR, et al. : Ankle arthrodesis using anatomically contoured anterior plate. Foot & Ankle International 2010;31 (6):492-498. DOI: 10.3113/FAI.2010.0492. Kheir E, Borse V, Bryant H, et al. : The use of the 4.5 mm 90° titanium cannulated LC-angled blade plate in tibiotalocalcaneal and complex ankle arthrodesis. Foot and Ankle Surgery. 2015;21:240-244. Méndeza M.P.C., Gambab C., Hernándezb E., et al. : Tibiotalocalcaneal arthrodesis using a humeral locking plate. Rev Esp Cir Ortop Traumatol. 2016;60:119-124.